In non-heme metalloproteins, nature exploits the properties of transition metal ions in a large variety of structural scaffolds. These proteins function, for instance, as electron transfer proteins or enzymes. We are studying different representatives of this protein family, including iron-sulfur proteins, copper protein, molybdoenzymes, and non-heme iron proteins. In these cases, resonance Raman (RR) and EPR spectroscopic techniques can contribute to the elucidation of the active site structure. Electrochemical studies provide further information about the electron-transfer properties. Special emphasis of our research is laid on hydrogenases that catalyze the reversible cleavage of molecular hydrogen (O. Lenz; I. Zebger). 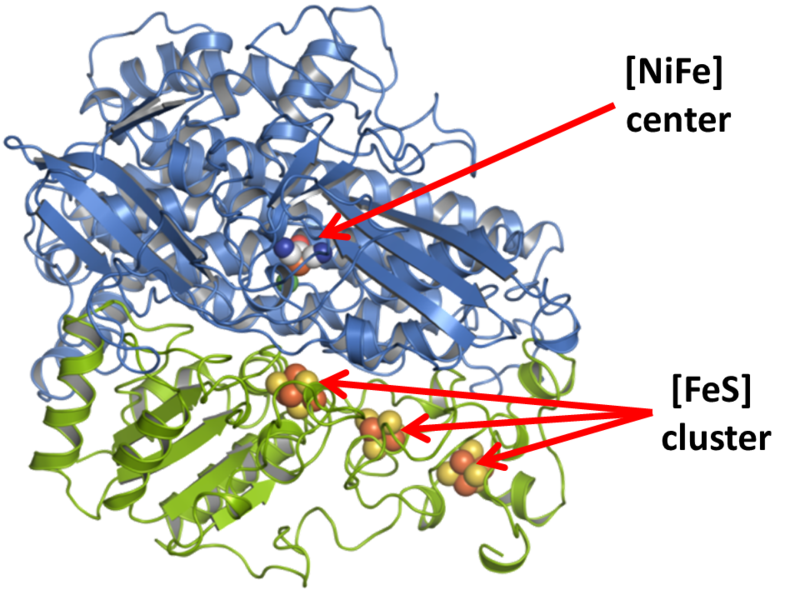 Here we are particularly interested in oxygen-tolerant representatives of this enzyme family that carry a [NiFe] active center and various iron-sulfur clusters (in the small subunit), serving as electron transferring cofactors. The catalytic bimetallic center includes an unsual ligation pattern with two cyanide and one CO ligands. 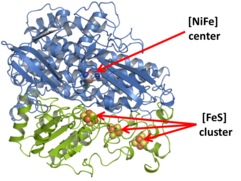 The stretching frequencies of these ligands can be probed by IR spectroscopy providing information about the oxidation and ligation state of the [Ni-Fe] center. Our IR- and RR spectroscopic and spectro-electrochemical studies of these enzymes in solution, immobilized on conducting supports, and in the crystalline state primarily aim at elucidating structure-function relationships including the molecular origin of the oxygen tolerance. Katz, S., Noth, J., Horch, M., Shafaat, H. S., Happe, T., Hildebrandt, P., Zebger, I. (2016) Vibrational Spectroscopy Reveals the Initial Steps of Biological Hydrogen Evolution, Chem. Sci. 7, 6746-6752. Salewski, J., Batista, A. P., Millo, D., Pereira, M., Zebger, I., Hildebrandt, P. (2016) New insights into the reaction mechanism of the NADH dehydrogenase type II from E. coli, Biochemistry 55, 2722-2734. Ciaccafava, A., Tombolelli, D., Dominik, L., Fesseler, J., Jeoung, J.-H., Dobbek, H., Mroginski, M. A., Zebger,I., Hildebrandt, P. (2016) When the inhibitor tells more than the substrate: the cyanide-bound state of a carbon monoxide dehydrogenase, Chem. Sci. 7, 3162-3171. Horch, M., Hildebrandt, P., Zebger, I. (2015) Concepts in Biomolecular Spectroscopy“, Phys.Chem.Chem.Phys. 17, 18222 – 18237. Siebert, E., Rippers, Y., Frielingsdorf, S., Fritsch, J., Schmidt, A., Kalms, J., Katz, S., Lenz, O., Scheerer, P., Paasche, L., Pelmenschikov, V., Kuhlmann, U., Zebger, I., Mroginski, M. A., Hildebrandt, P. (2015) Resonance Raman Spectroscopic Analysis of the [NiFe] Active Site and the Proximal [4Fe-3S] Cluster of an O2‑Tolerant Membrane-Bound Hydrogenase in the Crystalline State, J. Phys. Chem. B. 119, 13785–13796. Moe, E., Hildebrandt, P., Sezera, M., Todorovic, S. (2015) The [4Fe-4S] cluster mediated heterogeneous electron transfer in Endonuclease III is orientation and electrostatic interaction dependent, Chem. Comm. 51, 3255-3257. Horch, M., Pinto, A. F., Mroginski, M. A., Teixeira, M., Hildebrandt, P., Zebger, I. (2014) Metal-induced histidine deprotonation in biocatalysis? Experimental and theoretical insights into superoxide reductase”, RSC Advances 4, 54091-54095. Frielingsdorf, S., Fritsch, J., Schmidt, A., Hammer, M., Löwenstein, J., Siebert, E., Pelmentschikov, V., Jaenicke, T., Kalms, J., Rippers, Y., Lendzian, F., Zebger, I., Teutloff, C., Kaupp, M., Bittl, R., Hildebrandt, P., Friedrich, B., Lenz, O., Scheerer, P. (2014) Reversible [4Fe-3S] cluster morphing in an O2-tolerant [NiFe] hydrogenase, Nature Chem. Biol. 10, 378-385. Current collaborations: M. A. Mroginski, TU Berlin; H. Dobbek, HU Berlin; P. Scheerer, Charité Berlin; R. Bittl, FU Berlin; S. Leimkühler, Univ. Potsdam; S. Todorovics, M. Teixeira, M. Pereira, ITQB/Lisboa.